Outlook lets you add an expiration date to email you send or receive. 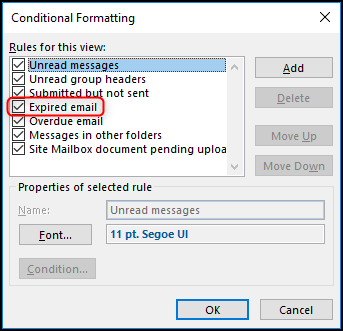 Once the expiration date has passed the email will be displayed with different formatting, and you can use Outlook’s built-in tools to manage expired email automatically. 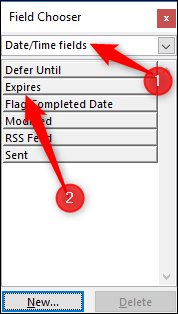 To add an expiration date to an email you’re sending, you need to open the Properties window for the email. Open the email and then click Message > Tags. This will open the Properties window for the email, which you can also access by clicking Options > More Options, or File > Properties. Switch on the “Expires after” checkbox and then choose a date and time. Click Close to return to your email. There won’t be any visible signs that an expiration date has been added, and you can send the email as normal. To add an expiration date to an email you’ve received, open the email and click Message > Tags (or File > Properties). This opens the Properties window for the email. There aren’t as many options for a received email as there are for a message you’re sending, but you can still set an expiration date and time. What Does an Expiration Date Do? So you’ve added an expiration date to an email. That’s great and all, but what’s the benefit of doing it? Expiration dates are used in a variety of ways by Outlook to help you focus on what’s important. 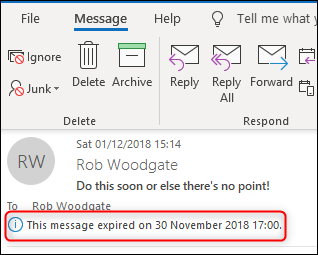 Emails that have expired are generally not as important as emails that haven’t expired, so Outlook automatically formats expired emails differently. 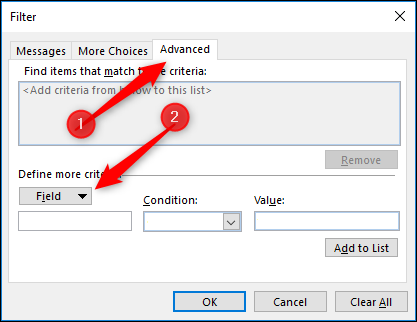 If you’ve looked at setting conditional formatting in Outlook, then you may have noticed the “Expired items” formatting rule. 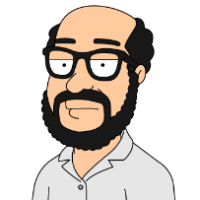 This rule formats any email that has passed its expiry date with a gray font and the text struck through. This lets you know that the email has expired so you can focus on more important emails first. If you’ve sent an email with an expiration date, this formatting will be applied in the recipient’s Outlook as well, but other email clients like Thunderbird, or web apps like Gmail or Yahoo! Mail, will ignore the date and do nothing with it. Select “Date Time fields” from the drop-down and then select the “Expires” option. 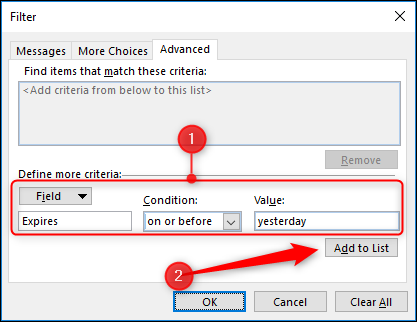 Drag and drop the “Expires” item into your folder to add it to the columns. When you open an expired email, Outlook notifies you with a message in the header. You can still reply to or forward an expired email, but if you try to forward it, Outlook shows you a warning first. Click “Yes” to send the email, or “No” to cancel. If this is switched on, then AutoArchive will delete or move (depending on the other settings) any emails where the date has passed. This is a great way to remove expired emails automatically and stop them cluttering up your mailbox. 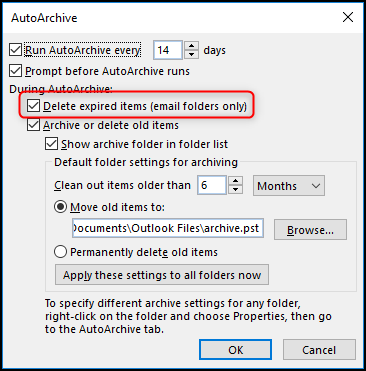 If you don’t want your expired emails to be deleted or moved, but you don’t want to see them in Outlook either, then you can set Outlook’s synchronization rules to prevent them being downloaded from the Exchange email server. When you’re building your synchronization filter, click the “Advanced” tab and then the “Field” button. Select Date/Time fields > Expires from the menu. 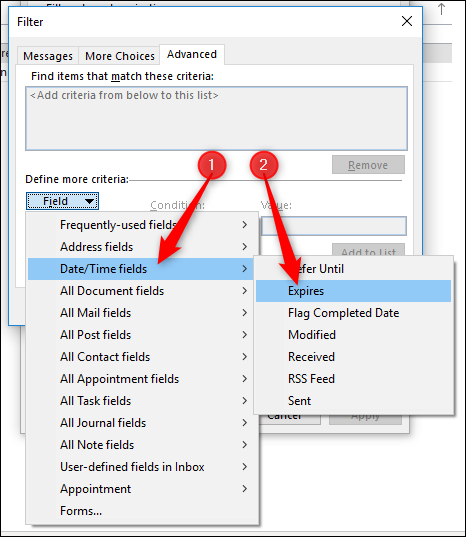 The field is available in the “All Mail fields” and “All Post fields” options as well. 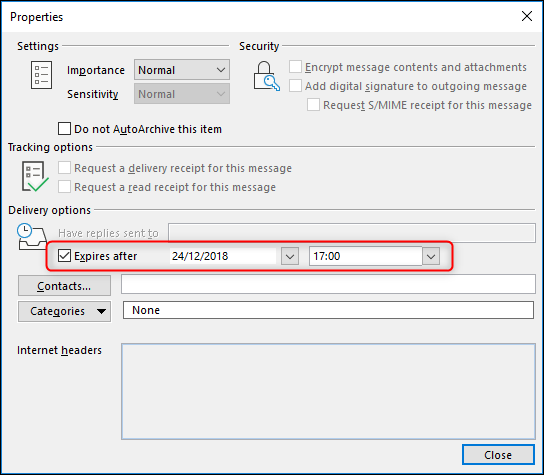 This will filter all expired tasks so that if they expired yesterday or earlier, then they won’t be synchronized with Outlook and won’t appear in your mailbox. They’ll still be available in the Outlook web app if you want to see them there. Enter the number of days after which you want messages to expire and then click “OK.” This will automatically add an expiration date to all of the emails you send. 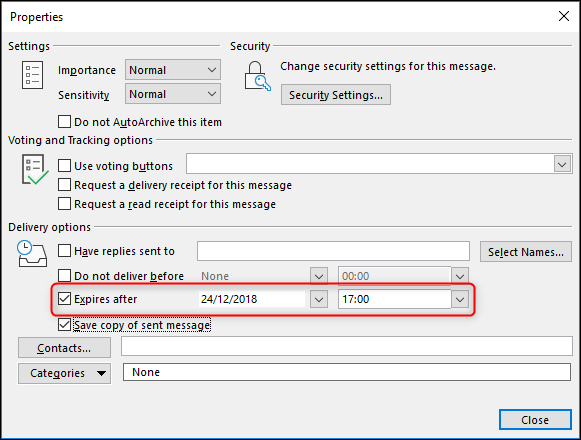 Expiration dates are a useful way of managing your priorities and your mailbox by low-lighting messages that are no longer relevant and allowing you to use Outlook tools to delete or hide messages you don’t need anymore. It’s one more tool in the fight to prevent your mailbox from getting out of control and a very useful tool at that.